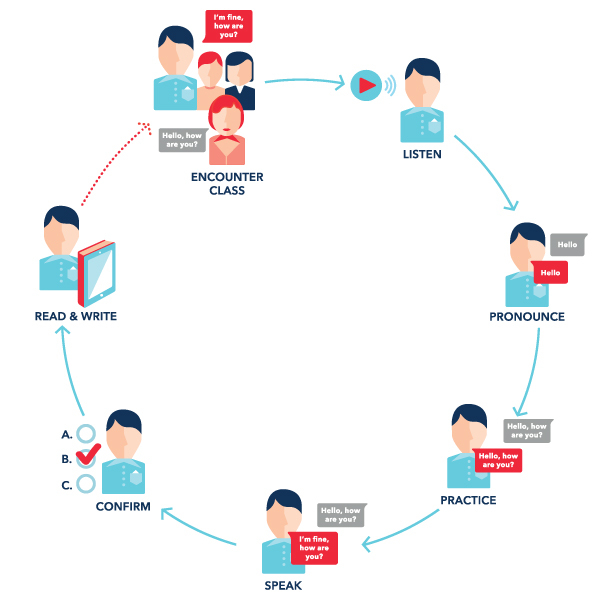 Wall Street English Learning Cycle, the core to English learning, is a multi-stage learning process, which is based on the natural approach of acquiring one’s mother tongue. Coupled with the natural approach and multi-method, our English course caters to the needs of Hong Kong people who aim to improve their English comprehensively in listening, speaking, reading and writing. Besides, our total English speaking environment, personal tutors and flexible learning hours also play an important role in students’ learning experience. With our latest interactive learning videos, you can master your listening skills, expand your vocabulary, and improve your pronunciation and grammar. Digital Books cover the key content of English Anytime in written form which can reinforce and consolidate your understanding of vocabulary and grammar usage in the unit, thereby improving your writing skills in a coherent manner. Each Encounter Class has 1 to 5 students who are all at the same learning level. Native English teachers will guide you through different interactive activities, ensuring that you will learn properly. Additional speaking practice. You are going to actively interact with 8-12 students at similar learning levels. Student-led roleplays, games and group discussions can expand your vocabulary and improve your English speaking fluency, thus increasing your self-confidence in using English. Social Club Activities offer students a fun and interactive way to immerse themselves in a total English environment. Activities include Chat Café, movie nights, sports events and other special festive events! Come and join our English assessment for FREE. Our online social networking platform offers you an opportunity to meet Wall Street English students and teachers from all over the world. You can easily share pictures, ideas and comments with each other. You should definitely fit this online lesson into your busy schedule. It can expand your vocabulary and improve your English speaking fluency.